Does it always seem that other people’s dogs are better trained than yours? Or is that just us?! Either way, we always find it so useful so get tips from fellow dog owners. 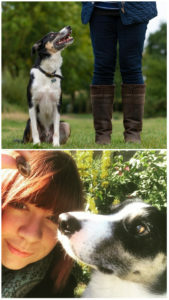 So we asked a few of the lovely ‘Friends of The Lounging Hound’ to tell us about their experiences with training their dogs. They’re not experts – just real people who have worked it out as they went along. “Training our collie Winston was, to be honest, a complete nightmare. We got him at seven months and he had never really been on a walk which meant that outside was literally mind blowing for him. Nothing (and I mean nothing!) was as exciting as freedom. We tried all the high value treats that you could imagine, but getting him to even look at us was impossible. After several frustrating months we decided to try some games, instead of formal training. Firstly instead of recall, we taught him ‘here’. This meant that he had to hit my hand with his snoot and I would throw him a treat. The combination of throwing the treat and a simple action for him eventually became fun enough for him to do it outside. First the garden, then the drive, then further afield. It took three months before he would do it at the park. While not a conventional recall it did mean he had to come within close proximity of me meaning that I could get the lead back on him! It also meant he learnt to accept that if he took time to eat a treat outside he wasn’t missing anything. Winston had serious FOMO. My top tip (and I know some people will roll their eyes…because I did when I was told it) is patience. I cried, I screamed, I had tantrums and wanted to give up. I had resigned myself to the fact that Winston was going to be an ‘on lead’ pooch. Now at two and a half (I can’t believe I’m writing this) he actually turned tail when called mid-chase of a rabbit. Six months ago that was inconceivable. 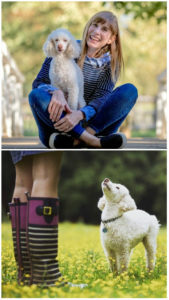 Collar Club – the subscription box for dogs, full of natural treats and safe, eco-friendly toys. 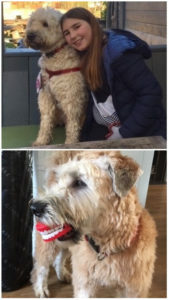 “We took George to classes so that I didn’t make the same mistake as I did with Bruno – over treating to the point that he wouldn’t do anything without getting something! The classes worked, though I’m not sure how. 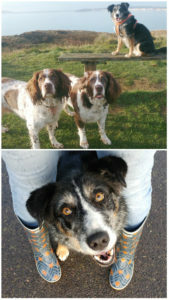 Winnie, who came to us at nine months, has 100% recall – but she will expect something in reward! 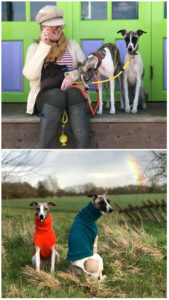 Redhound for Dogs – stylish attire for sighthounds (we love their washable quilted jackets). “When we decided to get a dog, we never expected the training to be so hard. We found it easier to teach Stanley tricks rather than recall (which we are still working on!). To begin with, we did teach Stan to sit, as most tricks begin with sit. Every time he sat down himself, I would say sit and hand him a treat. Then I began to hold my hand up while saying sit and then give him a treat. Later, I would just ask him to sit (this took a few attempts but he got it in the end). After visiting my Gran’s house and seeing her dogs shaking hands with her, I decided to try this with Stan. I got him to sit and then gently lifted his paw up and said ‘paw’ and gave him a treat with his paw still in my hand. He did this around 5 times, then I held my hand out and said ‘paw’ and when he didn’t do it, I picked up his paw and said ‘paw’ but didn’t give him the treat until he did it himself. I also taught Stan to lie down and roll over. To do this, I asked him to sit at first and then to lie down on the floor. Then I put the treat on the opposite side of him to his head, so he would need to roll over to get the treat. It worked and now he rolls over all by himself, just like a Show dog! “Before Bertie joined us permanently, he used to come and stay once a week, and sometimes weekends. I noticed he had a penchant for picking up and chewing things on walks. To start with, it was pretty much anything – sticks, leaves, acorns, whatever was in his path! I was worried that he’d eat something that would harm him so started teaching him the ‘drop’ command. 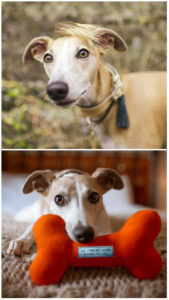 Fur & Fables – awesome dog photography for people who put their pets first. “We all call our dogs back to us using their name, but the power of this can be diluted over time – especially when something more interesting is in front and you are behind. Teach your dog a phrase to attract their attention immediately – one which they associate with a yummy treat, for example, and not with being reigned in to go home. For mine I use ‘watch me’. Use it in all different scenarios – when just walking on the lead, at home when they are chilling, when they are off lead – and make sure they get a treat or throw of the ball (whatever is really valuable to them) every time. The Dog And I – handmade luxury grooming products for dogs, made with all-natural ingredients. “Like everyone I’ve found some parts of dog training super easy and other parts I’ve yet to crack! Dandy is our little rescue, so he came to us with lots to learn – he had to learn stairs and refused to walk on grass. One of our biggest learning curves was to get him to settle when he couldn’t see me. Every time I got up, he got up – bless him. As time progressed I tried quietly getting up from my desk. He’d look at me, so I’d ask him to wait and over time he would. He gained confidence and finally he could wait on his bed for as long as it took me to go to the loo! Dotty Dog Art – delightfully dotty pet portraits and greetings cards.